I first saw Green Faerie Farm's Bunny Lawn Mower a year or two ago, and thought that was a great idea. 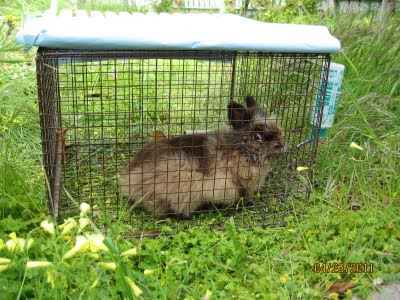 It's a wheeled cage with rabbits inside, so that the rabbits eat the weeds and fertilize the soil with their poop. I thought that I should have Dusty doing the same thing. I was once again reminded that I should put Dusty to work after my most recent visit to Green Faerie Farm. Today, I carried his cage from under the patio to a patch with lots of Bermuda Buttercup, another weed that keeps spreading on its own. I have seen Dusty eating this particular weed in the past, so I placed the cage there and removed the bottom trays. I placed Dusty inside. He was busy sniffing everything for a while before settling down and munching on some weeds. I put a piece of plastic tarp on top of the cage and one of bottom trays on top of it to keep it from blown away. This way Dusty could stay in the shade while he was outside. I shall make a hammock for him like the one they have for Green Faerie Farm's rabbits. I don't expect Dusty to be as efficient as Green Faerie's rabbits since they work as a team of 4 or 5. Green Faerie Farm is a homestead farm in Berkeley. They raise dairy goats, rabbits, chickens, keep bees, and grow many kinds of vegetables and fruits. 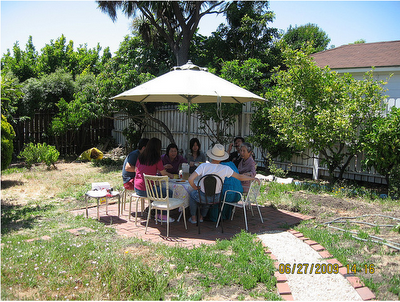 This past Sunday, Master Ken arranged to have our Beneficial Beasts in the Garden class to meet at Green Faerie Farm. Co-owner, Jim, gave us a tour and a list of tasks that he would like our help, including grinding flax seeds, vaccinate the goats, pull out the nasty hay out of the goat barn and add it to the compost pile, chop some bamboos, and treat the rabbits for ear mites. The goats and kids were quite friendly. They liked to be petted just like other pets we are familiar with. Some rabbits were kept in the same enclosure with the goats and chickens. It was fun to see all the animals living in harmony. Besides the animals and vegetables, the farm has a wide variety of fruit trees - avocado, plum, grapefruit, walnut, kiwi, pear, orange, thorn-less blackberry, mulberry, etc. Jim has also attended Scion Exchange for some of his fruit tree collection. Our potluck was quite a feast, including homemade candy cap cream cheese, coconut macaroons, baked yam, hummus, couscous, homemade ranch dressing, cultured butter, several kinds of homemade pickles, and Tara's organic ice cream. Lisa also brought a variety of her award winning kombucha drinks. Her latest flavor is rose kombucha. As the weather gets warmer, I have been out on the farm picking snow peas and checking on the fruit trees on a regular basis. Last weekend I was surprised to see a bunch of oyster and Shiitake mushrooms growing on the mushroom blocks I got from Far West Fungi back in October last year. They were big and some of them were a little past their prime. I couldn't believe that I didn't see them earlier even though I have been working out on the farm almost everyday. It was as if they popped out overnight. I now keep the blocks under the propagation table, which gets misted everyday for all the vegetable seeding on the table. The water drips down the table onto the mushroom blocks to keep them from completely drying out. I picked all the mushrooms to make a plate of sauteed mushrooms. I also added some thinly chopped green onions just before I turned off the stove. Today I thought I would check on the blocks again, and there are more Shittake mushrooms popping out. I am going to let them grow a little bigger before having them for dinner. Towards the end of our Sunday potluck, I saw Jason brought over two Tupperware full of lemon and lime wedges, a bag of salt and vinegar chips, and a brown paper bag. I thought that was odd that he brought in his potluck item when we were almost done eating, but what were the lemon and lime wedges about? Surely we weren't just going to eat them. Jason brought in 5 berries and a pack of mberry tablets, which are made from miracle berries. He also brought in lemon and lime wedges, a bag of salt and vinegar chips, and a bottle of apple cider vinegar for us to have a taste test. I became more and more excited as Master Ken explained what these berries do. The fresh berries were ordered online, and they were $5 each! The tablets were picked up from a store in New York when Jason was there recently. Many of us donated a few dollars to Jason since he spent quite a bit of money to get these items. The berries were cut up in small pieces and the seeds were saved so we can try to grow them in the green house. Some of us took the fresh berry pieces and some took the tablets. I took a tablet. For a few minutes, we sucked on the tablet and swirled it inside of our mouths so it could start to take effect. As soon as the tablet completely dissolved, I started with a piece of lemon wedge. "It tasted like a piece of sweet orange. It didn't taste sour at all!" I announced to the group. Now everyone started to take lemon wedges or lime wedges. I then tried a piece of lime. It was sweet as well. That was so amazing. I took a small piece of strawberry, and it was super sweet. The cherry tomato was sweet. The apple cider vinegar tasted really good. Wow, I couldn't believe it! The lemon and lime wedges were disappearing fast. We were all trying different things on the table and laughing. It was just amazing. All of us are pretty healthy, and we certainly don't have much need to enhance our taste in sweetness. We talked about how cancer patients and people with health issues can benefit from the berries. I personally never consume artificial sweeteners. I have grown stevia and I love pure honey. I use real sugar when I bake sweets. For people who can't have real sugar, Miracle Berry would be a much better alternative than any artificial sugar substitute. This past Sunday's class was quite exciting. First, we had a swarm of bees to capture then we got to try Miracle Berry and MBerry tablets. 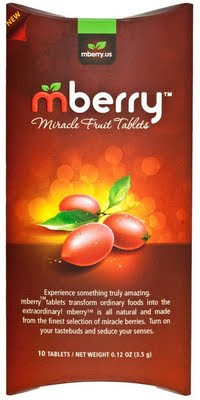 I will have to write about the experience with Miracle Berry in a separate blog entry. When I got to the class on Sunday, it was windy and overcast. When I left the box of oatmeal cranberry white chocolate chip cookies on the potluck table, there was no other food item there. I wondered if we were going to have anything to eat. A few people were scattering around the hill. I heard them talking about a bee swarm. A bee swarm! Awesome! I made a connection with bees last May when I first witnessed the capturing of a bee swarm. I immediately ran over to my car to get my camera. I had to get it on video this time. Master Ken, David, and John showed us a prototype top bar beehive that Nobuto made with a half wine barrel. Nobuto was in one of the classes last year. He has carpentry experience and the work he did with each top bar shows. They all fit perfectly on the top of the wine barrel. I remember how much difficulty I had trying to make a top cover for the fish tank that I donated to the class for snail ranching. They set up the wine barrel beehive for the new swarm we were going to capture. By now I am pretty calm with the bees buzzing near me. I also have a lot of trust in John, Master Ken, and David as I have seen them handling bees over several semesters. John keeps bees on his own homestead farm, so he has his own first hand experience with bees. Unless you were as fortunate as I to personally witness bee swarm capturing with this group of people, it is hard to convince you how peaceful it felt. Of course you have to remain calm. Master Ken also mentioned that bees do not like the smell of banana, so don't eat banana before getting close to the bees. The video is about 7 minutes long, but the actual process was more like 1 hour. It was done very slowly and carefully. They are not commercial beekeepers and tried not to hurt any bee in the process. Pruning the branches to get ready for capturing the swarm. After David brushed all the bees into the beehive, they put the top on the wine barrel to let the bees settle in. We filled the buckets which the legs of the beehive bench sit in with more water. The water prevents the ants from crawling up the bench to get into the hives. The weeds and tree branches around the beehives were also removed to prevent them from touching the beehives and became bridges for ants. If ants got into the hives, the bees would abandon the hives. Mixing the ingredients. Note my new cookie dough scoop! I was trying to see what I can make for Master Ken's class tomorrow. We have a potluck during every class meeting, and I love it. It's rare for me not to bring any food to share. I looked into my pantry and saw 2 bags of dried cranberries. I got them not long ago when they were on sale, buy one get one free. I grabbed one of the bags and looked on the back. I have found quite a few excellent recipes from packaging of food items. Ha, a recipe for Oatmeal Cranberry White Chocolate Chunk Cookies, and I have all the ingredients! Preheat oven to 375 degrees F. Using an electric mixer, beat butter and sugar together in a medium mixing bowl until light and fluffy. Add eggs, mix well. Combine oats, flour, baking soda and salt in a separate mixing bowl. Add to butter mixture in several additions (My tip: Important step! Do not dump it all in at once! ), mixing well after each addition. Stir in dried cranberries and white chocolate chips. Drop by rounded teaspoonfuls onto ungreased cookie sheets. Bake for 10-12 minutes or until golden brown. Cool on wire rack. Makes approximately 2-1/2 dozen cookies. I got a new cookie dough scoop last year. It was a bit pricey but my first cheap cookie dough scoop fell apart on me. Hopefully this expensive scoop will last. I also just now realized that I used baking powder instead of baking soda. The cookies turned out quite well, so it appears it is okay to use baking powder. These cookies smell incredible. I love the smell of freshly baked pastries. I wish I knew how I could bottle this awesome smell and use it as home scent. Is there such a product? I guess those scented candles are for the same purpose. I ate 3 cookies as they came out of oven. Although I adjusted the recipe, I still ended up with 36 cookies. Tomorrow morning I don't have to get up early to cook or bake, and we will have dessert at the potluck! When I was pulling weeds yesterday, I thought about how I put together this brick patio all by myself without spending any money other than gas for transporting the free material. 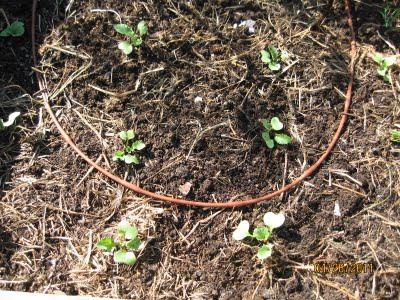 It was back in 2009 before I started my vegetable garden. I just wanted an area in the middle of the yard that I could put a patio set as a gathering spot. I didn't want to spend too much money on the project, so I started looking into "free" section under "for sale" on craigslist.org. I was only interested in picking up free material within 5 miles radius from home. The posting I had been waiting for showed up one Saturday morning. A house up in Kensington was being remodeled, and they had taken down their old fireplace. The bricks from the fireplace were outside of the house free for the taking. I responded to the posting, got the address, and went up to get the bricks. I roughly estimated that I needed at least 400 bricks for the size of my patio. The bricks were quite heavy, so I made at least 6 trips in two days to upload and unload the bricks. I also picked up some free sand from a house in Berkeley. Before I could lay the bricks down, I had to dig up the weeds. That digging was a back breaking job since the soil was extremely dry and hard. 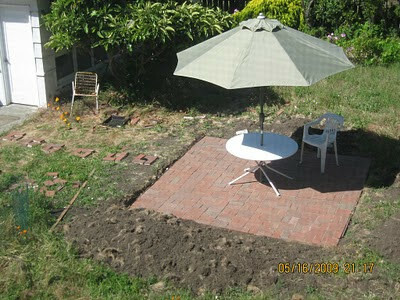 Finally, on April 29, 2009, I start putting the bricks together. I had never put anything together like this before, so I looked up some patterns and methods on the internet. That was all the knowledge I had. Everyday after work I was out there assembling my patio for the next two weeks. Some bricks had mortar attached to them, so I had to either try to knock the mortar off or dig the ground to fit the uneven bricks. As I was finishing up the patio, I picked up a free patio table with 2 chairs in Albany. The table was small enough to fit into the back of my PT Cruiser. I put 3 coats of paint on the table. I also picked up a free patio umbrella from a nice elderly woman in El Cerrito Hills. The woman explained to me that the squirrels had chewed up the fabric at a few spots; other than that, it was a really nice umbrella. I didn't mind the holes. I could sew them up easily. That was a much easier job than paving the bricks! So, this is how I got my patio. About a month after its completion, I hosted my first BBQ in the garden to celebrate my cousin's going off to college. A couple Sundays ago, Master Ken spent at least an hour talking about mulching and weed control. He said that he personally doesn't spend much effort fighting weeds, but if we really want to suppress weeds, we need to get 3-4 inches of mulch. 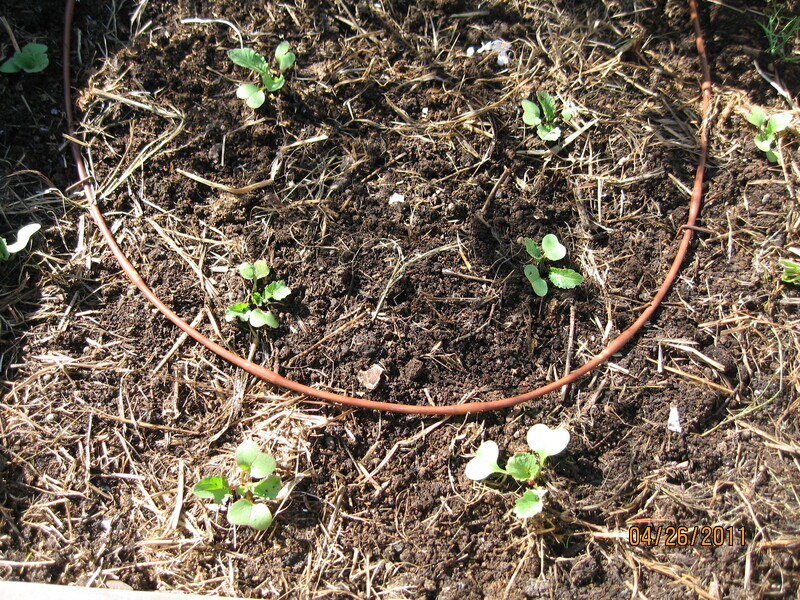 When Backyard Food Garden worked on Sand Village Farm last year, they dumped 2 truck loads of mulch on the farm. It barely covered the area. Now after the rain season, much of the weeds have returned. I also noticed some new weeds that I don't remember seeing before. During Master Ken's lecture, Crabgrass and Bermuda Grass were mentioned as two common tough weeds to control. I didn't know exactly what they looked like at the time, but I was pretty sure I have both on the farm among many others, such as California poppy and Nasturtium. 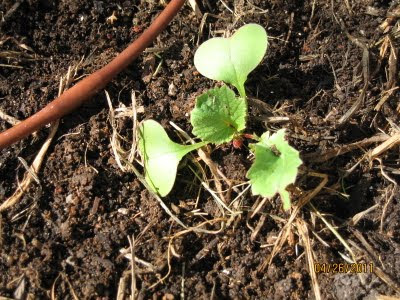 Anything can be a weed if it is growing in the areas that you don't want them to be. The patio area was now covered with weeds. You could barely see the patio. 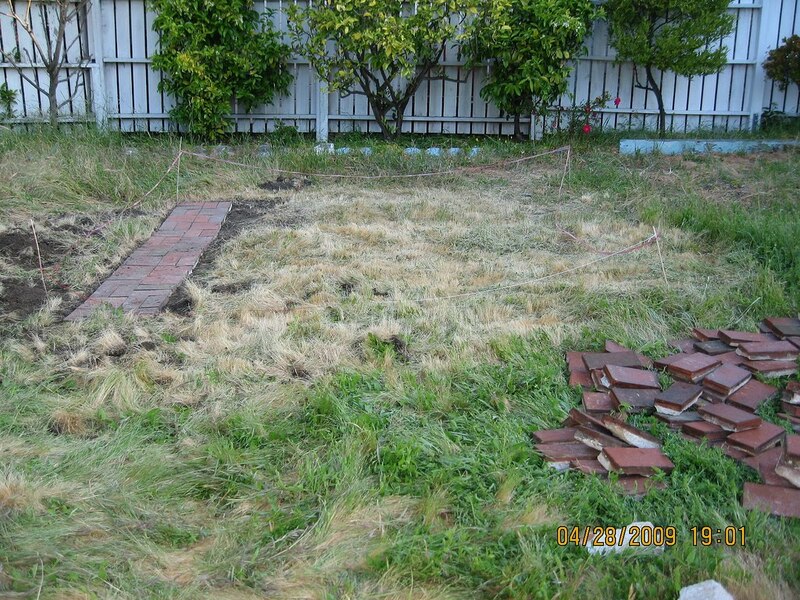 It was time to pull those weeds out, so I can host BBQ gatherings during the summer months. I spent just under an hour pulling as many weeds as possible from between the bricks. It gets hot very quickly when you are doing bending, squatting, and pulling under the sun. I got about half way done and decided to finish up later on, possible after the sun goes down. I saved a few California poppy and nasturtium plants that I pulled out. A friend of mine loves anything orange including orange flowers. California poppy and nasturtium both have bright orange flowers, so I am going to see if I can get them to grow in a couple pots. From past experience I know they don't transplant well. 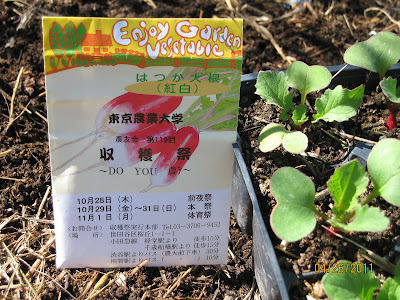 Alternatively I can grow them from seeds. I grafted some apple, plume, and cherry scions after coming back from the scion exchange in January. It was my first time grafting fruit trees. I found out later on that the ideal grafting weather is a heavily overcast day. A sunny day would great reduce the success of grafting because the scions have a much higher chance of drying out before establish themselves on the trees. Additionally, I didn't have enough grafting tape. After stopping at 2 stores and not able to find any grafting tape, I simply used some masking tape that was readily available in my garage. I didn't expect much success in my first attempt to graft. To my surprise, one of the cherry scions is now blooming! In the picture above, I grafted 2 scions to one branch. One of them is budding and blooming. This is the only scion that shows obvious signs of life among all the scions I grafted. I might have additional success on the apple tree, which I will find out in a month. In addition to grafting, I also planted one cherry scion in a small pot. It appears to be still alive although I am not sure how much it has rooted. It got knocked over a few times either by squirrels or birds. I also planted a small Capulin cherry tree in December. This is a fast growing variety which can reach 10 feet in 12-18 months and eventually reach up to 30 feet. I will have to make sure to cut it back so it doesn't reach 30 feet! I can't possibly pick the cherries from a 30 feet tree. Master Ken actually told us in the class that we will most likely not getting any cherries from our yards if we don't have any barrier to keep birds and squirrels away.